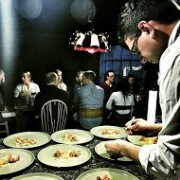 Chef Jacob Demars of Chicago readies a course at a recent pop-up dinner. He’ll prepare a 12-course dinner at the Des Moines Social Club Nov. 20-21. We just found out that chef Jacob Demars of Juno Sushi in Chicago is coming to the Des Moines Social Club’s Culinary Loft Nov. 20-21 to host two private, 12-course dinners. Only 12 seats will be sold for each dinner, making it an intimate experience for the lucky few who can grab tickets. The event is organized by Open Circuit, a Chicago company that hosts pop-up dinners once a month in random locations. Zachary Mannheimer, the Social Club’s executive director and a restaurant sommelier, is choosing the wines for the dinner. Tickets cost $150 with wine and $100 without wine and will surely sell out fast. You can purchase them here for Nov. 20 and here for Nov. 21.